Christmas Lights Cookies with a small batch of royal icing and mini M&Ms as Christmas Lights. Brace yourselves. I am NOT a cute cookie decorator. However, I pushed through and made these Christmas Lights Cookies to impress my kid. 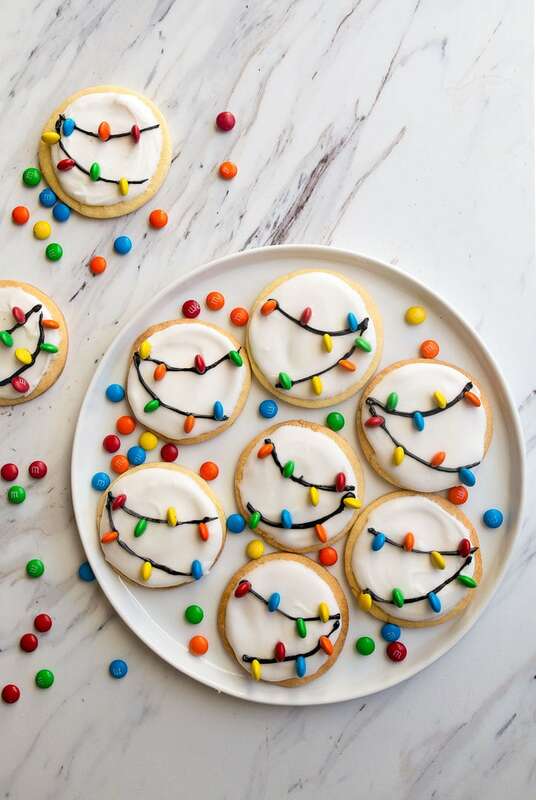 I saw a fuzzy photo of some cupcakes on Pinterest where they turned mini M&Ms sideways to look like Christmas lights on a string. I thought that was so cute and clever, but also: so easy, yet impressive. Big emphasis on the EASY. If I haven’t mentioned to you before, my Camille is very into M&Ms (she pronounces it yem-a-nems), and I know it’s because of the bright colors. I bought a bag of mini M&Ms for this, and set to work making a small batch of cut-out sugar cookies and a small batch of royal icing. My small batch royal icing recipe is one of my favorites! I actually already had a perfect recipe for a small batch of cut-out sugar cookies that makes just one dozen cookies from last year. I grabbed a biscuit cutter that fell somewhere between 3 and 4″ in diameter and was on my way. The small-batch royal icing recipe was a trial and error process, because I wanted one that we could spread with a knife. I firmly believe cookies for kids should not require a pastry bag. In order to accomplish this, though, you need to make and use the royal icing right away. I scoop small spoonfuls of the icing into the center of the cookie, and then spread with an off-set spatula. The icing will spread a small amount on its own, but for the most part, it will dry in-place. I love the crisp crunch of royal icing on a cookie, don’t you?! For the string part, I had visions of melting chocolate and squeezing it from a ziplock bag fitted with a small tip. But then, I grabbed a tube of black icing instead. The tube that specifically said it was for writing ‘happy birthday’ on cakes. The tip is very small, and so very much easier than melting chocolate. If you want to make these with your kids, first grab a glass of wine. Okay, I’m kidding. But not really. I suggest baking the cookies ahead of time and letting them cool completely before you tell your kid(s) that cookies are in the house. If I’ve learned anything about having a kid in the last 2.5 years, it’s that you don’t tell a kid something exciting is happening until it is actually happening that very second. Or, you spend 3 (or 30 hours) telling them why they have to wait. I think a dextrous toddler could help you frost them because it doesn’t require a piping bag. Have your babe(s) use a spoon to scoop dollops of frosting on each cookie, and then go behind them with an off-set spatula to spread it. 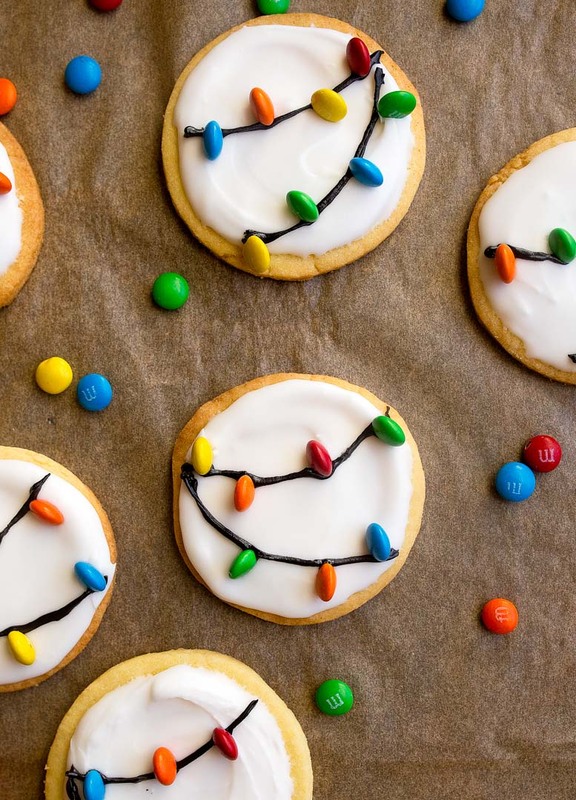 Let the cookie frosting set (bide your time by doling out mini M&Ms, if you have to). Then, pipe two thin stripes of the black frosting on each cookie. Let the person with the smallest of fingers press the mini M&Ms in place. Now, sit back and watch your kid shove cookies into their mouth in record time. But, relax, because this recipe only makes 12 cookies and they really can’t do much damage (as long as you’re simultaneously shoving cookies in your face). Happy Christmas Lights Cookie decorating day to you! In a medium bowl, beat together with an electric mixer the butter and sugar. Once light and fluffy, add the egg yolk and vanilla and almond extracts. Once well incorporated, sprinkle over half the flour mixture and beat gently until combined, then sprinkle over the rest. Beat until no streaks of flour remain, but be careful not to over-mix. Dust a clean counter top with flour, and dump the dough out onto it. Gather it into a ball and press it into a 1/2" thick round disk. Flour your rolling pin, then roll out the dough out big enough to cut out about 8 shapes. Place the shapes on a baking sheet lined with parchment paper or a silicone mat. Gather the dough scraps and re-roll to cut out 4 more shapes and place them on the cookie sheet. You should get 12 cookies. Place the cookie sheet in the freezer for the minutes while you preheat the oven to 350. Once the oven is hot, bake the cookies for 10-12 minutes, until the edges of the cookies just start to turn brown. Let them sit on the sheet a few minutes before moving them a wire rack to cool completely. Once the cookies are cooled completely, make the royal icing: in a small bowl, combine the powdered sugar and lemon juice. Beat the egg white in a small bowl to loosen them, and then measure out 2 tablespoons of egg whites and add them to the bowl with the sugar. Whisk together the icing, starting slowly, and trust that the sugar will melt and it will become liquid. Resist the urge to add any more liquid to the bowl, and instead just keep whisk slowly. When the icing comes together, spoon a small amount onto each cookie, and use an off-set spatula to spread it almost to the edges. Let the royal icing harden completely on the cookies before proceeding. Pipe two thin black lines onto each cookie, and then press mini M&Ms sideways (see photos for reference). This is SO amazing and the cutest idea ever!!! I must try it this season! And my niece is the same way with exciting news, my sister has to tell her the SECOND it’s happening or she won’t stop asking how much longer until it will happen. Too cute!! These look amazing!!! Could I make them a day or so in advance? How well do you think they’d hold up? The cutest cookies ever. Definitely trying and like always…love the small batch recipes. Cutest cookies ever! And thanks for the small batch royal icing! On my list to make over the holidays! These are adorable! I’m going to try and make them for our family party this year. So cute. Love how these look.. Such a great idea! I’ve never made royal icing, except to hold a gingebread house together – huge batch! Thank you for the small batch recipe! Will make this evening with my (3)2 and (2)6 year old daughters. We’ll have a blast and can have earnest discussions about the world or silly discussions about nothing! Sounds like such a fun evening :) Enjoy! It’s looking so cute and nice! !pictures looks getting mouth watering,Thanks for sharing,Merry Christmas!!!! I LOVE these. They are just too cute! Hi!!! How many days can these beautiful cookies hold up if i keep them in air tight container??? So, if I wanted to give these as a gift and stacked them in a bag, would the M&Ms stay on? They are so cute I would love for them to stay on, but need to transport them. Amazing recipe, currently attempting the royal icing.. does it ever soften? I swear mine is just playdoh what did I do wrong?! I think those chocolate covered sunflower seeds would work for the light bulbs as an alternative. If you put a piece of bread in the container with the cookies they will stay soft. So cute! We’ve been decorating cookies at Christmas with my 6 boys for who knows how long (my eldest is 16)! So fun for them to do (and my teens still want to decorate). I never thought to make Royal icing, but instead use a glaze made with powdered sugar and water/milk–or my favorite, lemon juice, depending on the embellishments (or no-sugar, straight-up, cranberry juice), and a little corn syrup can be added to give a shine. We used to use a spoon and knife to have the kids frost the cookies (more powdered sugar, stiffer glaze; more water, thinner glaze). You can dip the cookie in the glaze, too (can be messy for little hands). Then I found the Wilton decorating squeeze bottles. I put different colors in each bottle and the kiddos use them to put the glaze on the cookies–either flood or outline/embellish. Oh, yes, those little hands have to learn how to control the amount of squeeze when they start out. Such a fun memory to begin! I Love it !! Oui j’adore ! Does the lemon juice “cook” the raw egg yolk? THese look so cute! Can I bake the cookies ahead of time and freeze in an air-tight container up to a week at least? And then decorate the day I’m ready to serve? Can this recipe be doubled, or do you recommend making two separate batches? Have you tried using gluten free flour? Also is the lemon for flavor you could I use a flavored extract? I haven’t tried making this recipe gluten free. The lemon is for flavor, but the acidity also helps the egg white set. Love the lights idea. I plan on making these for our small town’s, Santa visit. But I’m going to change it up and use a tree cutter. Thanks! Can I use meringue powder instead of the egg white? You can! I’m not sure what the ratio is, though. Is there something on the side of the can that says ‘1 tablespoon = 1 egg white’ or something similar? You’ll need extra lemon juice or water to bring it all together. Have you had any bad luck with the m&m’s bleeding overnight? 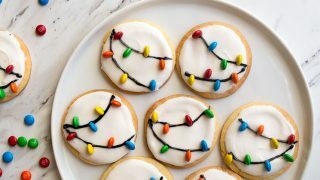 I was looking for a Christmas cookie recipes for my jobs Christmas party bake off and came across this Christmas light cookie recipe! 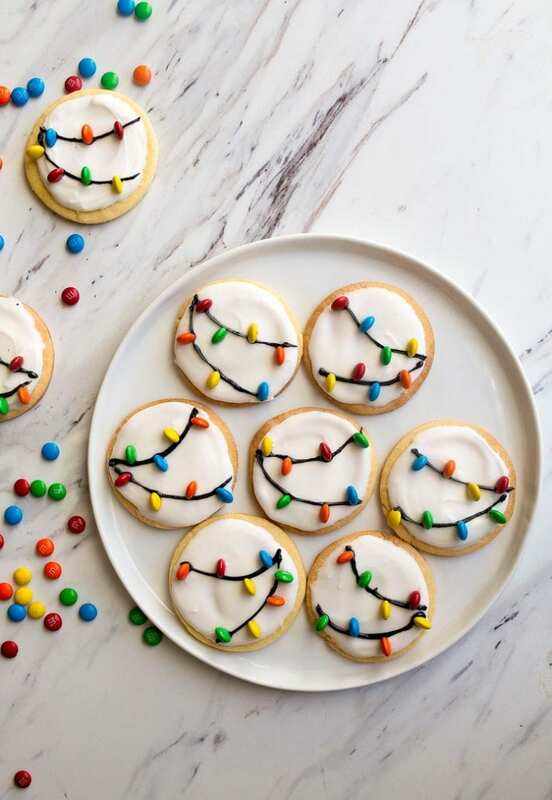 These cookies look simple to make and very delicious! Thanks for posting this recipe! Looking forward to making these for the party! I love these cute cookies how long can I store the decorated cookies in an airtight container? Is your nutritional information really right?! No, I corrected it. That’s for the whole batch. Hi! Just made these last night and they are great! However, the dough was soooo crumbly and I couldn’t even reroll the scraps more than once, though I had enough dough to make more. Did I mess up?! Can I include the egg white next time or would that not solve the problem? I make rolled cookies all the time so I don’t think I made a mistake but if you have any ideas let me know. Also for anyone who may wonder, I used meringue powder rather than egg white, and I colored some with black food coloring and it came out great. I used water instead of lemon juice. Thanks I’ll try more butter next time. The cookies were yummy but crumbled under the royal icing. Would a splash of milk or cream in the dough work as well? I guess I can just experiment!! I am usually careful with the flour but I can add in a little less next time and see if the dough comes together better. Does the recipe really only call for 3/4 cup flour or is it supposed to be 3-4 cups? It’s a small batch recipe, 3/4 cup is correct. Double if needed. I just made these using premade dough and confectioner’s sugar and milk icing. So easy, quick, and so cute! Wish I could post a picture. Pinterest win. Nailed it. Do you think I could use a buttercream icing or something other than royal for the white part? My daughter is allergic to eggs that haven’t been baked. There so good!! I think there a little salty, but other then that, there really good!! These were a huge hit at Christmas. So much so I had to make another 2 batches! My 11 year old, who loved completing the gorgeous mini m&m decorating, said they were the best cookies he’s ever had! And I can tell you this boy knows his cookies!